The Trans-Iron Galactic Element Recorder (TIGER) is a balloon borne instrument designed to measure the elemental abundances of Galactic Cosmic Rays (GCRs) wich are energetic atomic nuclei that originate from outside our solar system and are believed to be accelerated by exploding stars (supernova) to extremely high energies. GCRs are of particular interest to the astrophysics community since they are one of only two types of matter that can be directly sampled from outside the solar system. They serve as a probe of the galactic cosmic ray source and the interstellar medium within our galaxy. The TIGER experiment measures GCRs with atomic number between 26 (Iron) and 40 (Zirconium). These elements are very rare in galactic cosmic rays and are difficult to measure, requiring large detectors with long duration of exposure and excellent resolution. The instrument comprises two hodoscopes located on top and bottom of the instrument, two Cerenkov detectors in the core and beetween this two components a pair of scintillator detectors. The hodoscope detectors are responsible for determining the trajectory of a particle that passes through the instrument. Each hodoscope layer is composed of two planes of scintillating optical fibers, with about 1200 square fibers with 1 mm2 cross-section each. At both ends, these fibers are joined to 14 photomultiplier tubes (PMTs). As a nucleus enters one plane in the hodoscope, it will cause one or two fibers to scintillate as it enters and the light emitted is piped down the fibers to the two PMTs located at each end. A precise location of entry is given by reading out the signal in these PMTs. This information is needed to trace the angle that the particle had upon entry. The scintillator detectors are responsible for determining the charge of a particle that passes through the instrument. They are made of a special kind of plastic called poly-vinyl toluene so when a charged particle passes through it, it excites and ionizes the molecules in the plastic. In TIGER, there are four scintillating detectors, S1, S2, S3, and S4 for redundancy purposes. The S1 and S2 scintillators are the most important for deriving the charge of a particle. If the signal in the required detectors is high enough, the software decides that a particle has indeed passed through the detector, and proceeds to read out the light output. The Cherenkov detectors in TIGER are responsible for determining the kinetic energy that of a particle entering the detector. These detectors use an effect known as the Cherenkov effect that was put to use in High-Energy Astrophysics within the last 40 years. Since this effect is quite dependent on the charge of the incoming particle, two different nuclei entering TIGER with the same energy will emit different amounts of light into the Cherenkov boxes. In the TIGER instrument, there are two Cherenkov detectors. C1 is made with acrylic and C0 is equipped with aerogel, which incidentally holds the record for the least dense solid substance on earth. As a particle enters the light box, it precipitates the emission of Cherenkov radiation, which is detected by the 5-inch photomultiplier tubes (PMTs) located along the circumference of the ~1 m2 light box. 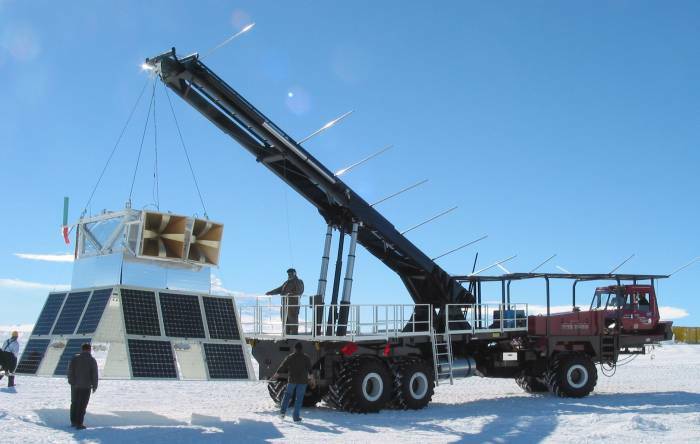 Also as piggy back was flown the ANITA instrument wich is a radio telescope to detect ultra-high energy cosmic-ray neutrinos from a scientific balloon flying over the continent of Antarctica. It will be the first NASA observatory for neutrinos of any kind. This was a prototype to the full ANITA experiment, called ANITA-LITE. It consisted of two radio antennas (instead of 32) and electronics to amplify and digitize the radio signals picked up from the ice. Flight operations began at 10:00 when "the Boss" (launch vehicle) picked up the payload and slowly began rolling out and up the hill to the launchpad. At 15:00 the balloon was rolled out and inflation began about a half hour later. At approximately 17:08 the payload was launched and by 18:15 had risen to 47,000 feet, by 19:00, to 78,000 feet, by 19:45, 112,000 feet. An initial float altitude of around 132,000 feet was reached at about 21:30. 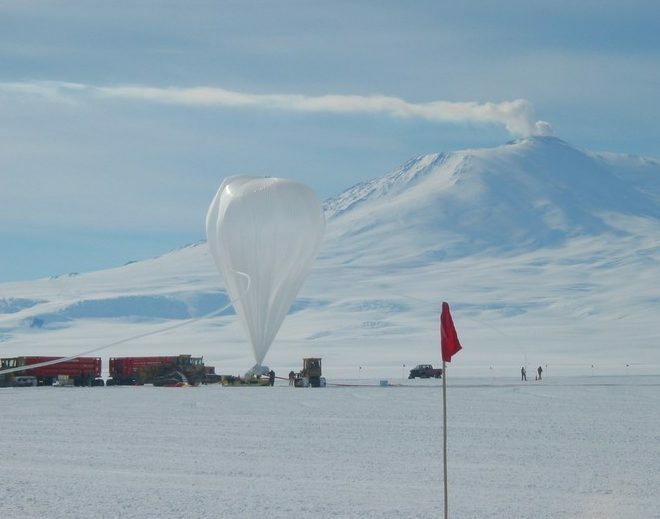 After finished about one-third of its second revolution, concerns about the possibility of the payload going to higher latitudes over the ocean caused NSBF to begin looking at where a good place would be to cut the payload loose from the balloon. And so at about 23:20 on January 4, NSBF began the process of valving down the balloon so that it will drop to a lower altitude before they give the command to explode the bolt that keeps the payload and the parachute attached to the balloon. The balloon was at an altitude of around 135,000 feet when the valving began. The payload was cut loose at about 3:23 January 5 at an altitude of around 110,000 feet. 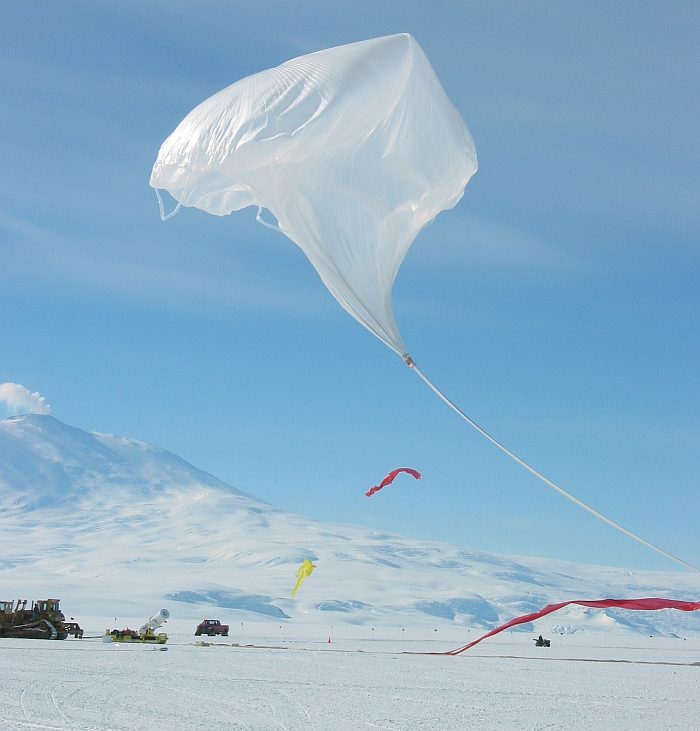 The payload took about 37 minutes to hit the ground at a latitude of -71° 45.6' and a longitude of 58° 45.6' near the Australian Mawson Base. During the flight virtually every subsystem planned for ANITA was tested including calibration pulses sent to payload from ~200 km away. 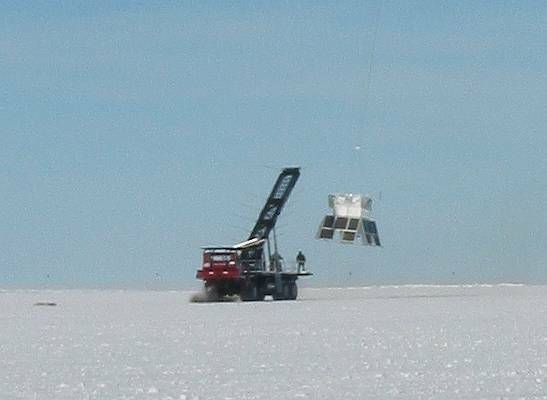 It gathered valuable information on the radio background that the full ANITA experiment will see in its flight currently scheduled for the 2006-2007 Austral Summer. Another piggyback payload was Project Aria a Washington University's K-12 outreach program aimed at inspiring students in science and technology through hands-on participation in actual space projects.